Oh my gosh! Totally forgot to do a blog post last Monday. I was exhausted after the fair ended last Sunday and didn’t have any brain power left to do a post. I apologize for that. The fair went pretty well. Like military plans, fair plans rarely survive first contact but we got most things done and fair-goers had fun. That’s all that counts. I’ve been posting pictures of livestock 4H and FFA winners on the fair Facebook page, https://www.facebook.com/pages/Northern-Gila-County-Fair/136645043024179. These kids work really hard raising their animals and learning how to show them. It seemed fitting to post their accomplishments. First Encounter, the first book in my new Brown Rain series is up on Amazon’s new Pre-Order feature. http://www.amazon.com/dp/B00MW8AYOK If you use another ereader, it’s also up on Kobo for pre-order at http://store.kobobooks.com/en-US/ebook/first-encounter-6. Release date is scheduled for September 18th. The garden is in fall mode. The green and yellow beans have withered, so no more of them. The peppers, both sweet and hot, are ripening. I may be able to roast and freeze the hot peppers soon. I have poblano and Fresno chilis. They’ll be very good this winter in my chili. I had to cut my mint down. The bees love the flowers but the flowers were going to seed. I can’t have mint seed spreading everywhere. I’d never get rid of the stuff. The bees can still visit the oregano flowers so they’ll have flowers until they go into hibernation. My butternut squash is also ripening. The very first ones to grow this spring are ready to pick. I’ll store them in my garage and the last ones will keep all winter. Tomatoes are sprawling all over. I still am picking more cherry tomatoes than we can eat. The regular tomatoes I par-boil, skin, chop and freeze. They’ll make great spaghetti sauce this winter. Do you garden? What’s still going strong for you? 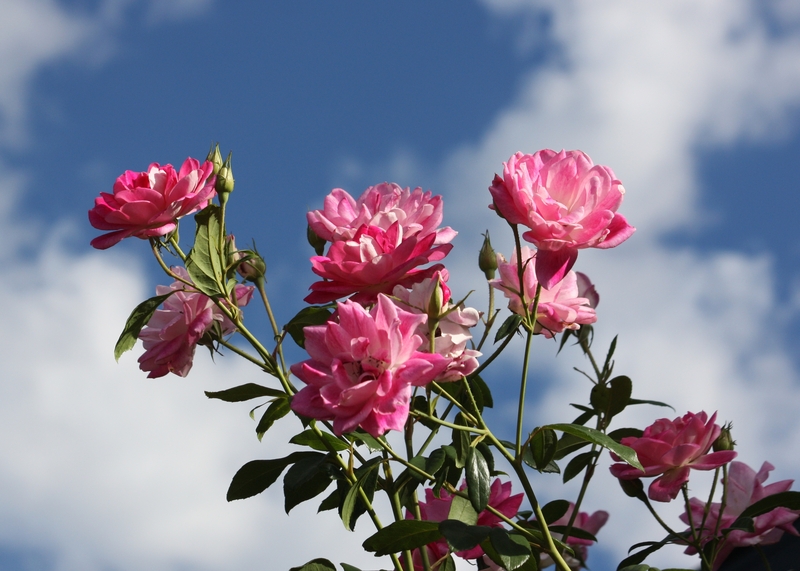 The picture accompanying my blog today was taken by my husband of some of the roses I have blooming right now. I love the way they look against this mid-September sky. Revolution: A Gulliver Station Story released August 1st! I’m pretty excited about it. You can buy it and my other books at: Apple, Amazon, Barnes and Noble, Kobo, or Smashwords today! This entry was posted in Author, Book Release, Connie Cockrell, County Fair, Every Day Life, Gardening, My Writing, Published Books, Publishing, SciFi and tagged Book for Sale, Connie Cockrell, County Fair, Gardening, Life, Novel, Publishing, SciFi by conniejean. Bookmark the permalink. This is a redally good tip especially to those fresh tto the blogosphere.